Yesterday we had an interesting discussion on the Mystical Positivist radio show with Dr. David Weisman, a neurologist and author who has written about how current findings in neurobiology falsify the idea of a unified soul governing the human organism (podcast here). Likewise I have discussed this issue in the context of Sam Harris' book, The Moral Landscape - How Science Can Determine Human Values in an early entry on this blog site (post here). The basic idea is that fMRI studies definitely show that activity in the brain's motor regions can be detected as much as 350 milliseconds to 10 seconds before the conscious decision to move has entered a test subject's field of awareness. The general conclusion that neuobiologists such as Harris or our guest, neurologist Dr. Weisman, tend to draw is that these results demonstrate that however much we think we are the authors of our own actions, physical processes below our level of awareness are determining how our physical system manifests. The inescapable conclusion is that what we subjectively experience as our "self" is in reality a fiction conjured up post hoc by the brain to maintain the illusion of an independent being having agency over the functioning of the body. As I have written in the past, it is hard to escape this conclusion regardless of your spiritual persuasion if one is being intellectually honest. But I made a connection this morning that I had not quite registered before that provides an interesting and challenging response to this neurobiological argument against free will. It involves the fairly large and independently reproduced data sets of what consciousness researcher, Dean Radin, calls "presentiment." Presentiment refers to measurable physiological behavior that anticipates a future stimulus regardless of a subject's conscious awareness of the physiological shift. Radin uses this term to distinguish presentiment from precognition which refers to a subject's conscious awareness of a future physical event. From 1997 through 2000, Radin conducted a rigorously designed experimental test of presentiment with three follow-on replications, all of which demonstrate to a large level of statistical significance (p=.001) that the body's nervous system can accurately anticipate a randomly generated future stimulus several seconds before the stimulus is presented in time (full PDF paper here). The basic idea of Radin's presentiment studies is as follows. Electrodermal activity (EDA) of test subjects is measured before and after the subjects are presented with an image that depicts either a calm image (e.g. nature scenes) or an emotionally charged image (e.g. violence, accidents), and the EDA data are analyzed for differential effects between the image sets. In the experiments, test a subject sits two feet in front of a computer monitor that displays a blank screen. The subject then presses a button and 5 seconds later a random number generator selects an image to display from a repository of several hundred images classified across a spectrum of calm to highly emotionally charged. The random image is presented for 3 seconds and then the screen goes blank again for 10 seconds. In the graph above, -5 seconds is the point at which the subject presses the button to initiate the test, and 0 seconds is the point at which a random number generator determines which image (from a set of calm or emotional images) is presented to the subject. 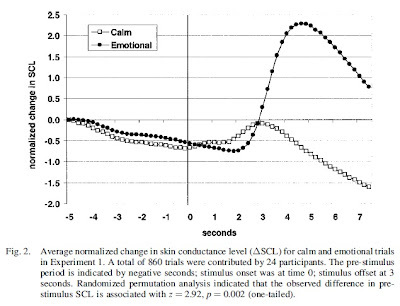 After the image is presented for 3 seconds, we see a strongly differential change in SCL when the subject sees an emotional versus a calm image. That is expected. But the radical thing in these data is that there is a statistically significant differential effect between the calm and emotional images 5 seconds prior to the random selection of the image yet to be viewed. This bears repeating: the SCL measurements were different 5 seconds before a randomly selected image was presented only when in fact it turned out that the image was emotionally charged. The subject's body was accurately responding in advance to a future stimulus all at a level below that of the subject's conscious awareness. If you are sufficiently startled by these results, I encourage you to read Radin's paper in full. He details how his experimental setup anticipates the possible objections to the methodology, he cites an independent review by skeptics of his protocol, and he cites independently conducted experiments that replicate his findings. I am personally convinced of the integrity of the results and the researcher here to move on to the question of what these results might say about my earlier discussion on neurobiology and the brain. These presentiment results change the character of the argument about free will and the brain considerably. The results cited by Harris show, for instance, that 350 milliseconds prior to a conscious willing to action of a physical movement, the motor centers in the brain are activating and preparing for the movement. 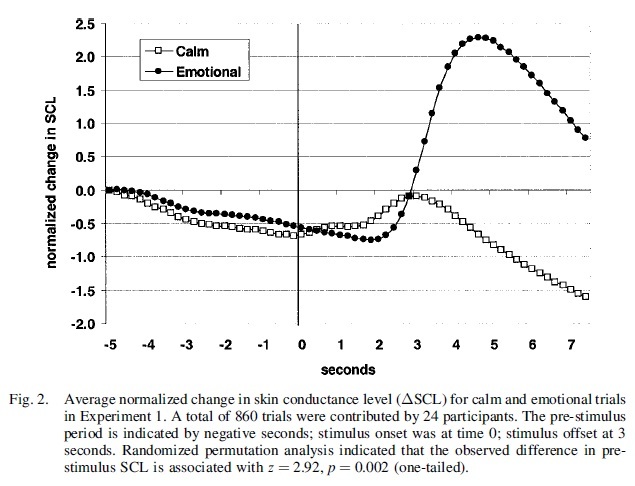 The results cited by Radin show that as much as 5 seconds prior to presentation of a randomly selected stimulus, a subject's autonomic activity is responding differentially according to the character of the yet to be presented stimulus. Taking these results together, it is not a far stretch to suggest that the moment of the arising in my field of awareness of my conscious intention to move my arm might function similarly to the random presentation of an image in Radin's presentiment experiments. The fact that we can measure activation of my brain's motor center seconds before my intention to move my arm registers in my field of awareness can be understood as an example of presentiment. Yes my nervous system is responding in advance of my intention to move my arm, but this does not necessarily mean that my conscious experience of intentionality is a fiction. The results of Radin's presentiment experiments support as plausible the interpretation that a "soul's" coupling to the body's nervous system models like the random presentation of emotionally charged images to a test subject. However counter-intuitive to our notions of causality, the nervous and autonomic systems of the body seem to demonstrate the ability to couple across time and anticipate as yet undetermined stimuli. Conscious intentionality can be modeled as one such future stimulus. Lest I be accused of overreaching here, I am not claiming that Radin's presentiment results prove the existence of a unified soul. But I am claiming that Radin's data negate the argument described above that the results from neurobiology necessarily falsify the idea that we have free will of some sort. The retrocausal anticipation in our nervous systems to a yet to be determined future event (e.g. the formation in consciousness of an intention to move) can be seen as a more general and strange property of our nervous systems. It does not prove that what we construe as our conscious intention is a fiction asserted post hoc by the brain system. Radin himself admits that "Anticipatory strategies ... is the most common and prima facie the most plausible conventional explanation for the observed effects" but he does not control for such a strategy. Instead, he looks for evidence of such a strategy in the form of a positive correlation with the number of trials since the last emotional image and finds that it "was positive, but not significantly so." However, the lack of statistical significance could easily be due to the smaller sample size involved in this part of his analysis. That seems like a simpler explanation than presentiment. He also argues that the participants "showed relaxation responses before the emotional target rather than progressive arousal" predicted by an anticipatory strategy. But the relaxation responses don't rule out an anticipatory strategy. It is possible to have progressive arousal over the course of multiple trials while still having relaxation before each target (e.g. imagine a sawtooth wave added to an line with positive slope). Moreover, an anticipatory strategy doesn't even need to produce progressive arousal to cause the effects that Radin is seeing. It is sufficient for it to just cause decreasing levels of relaxation. I think that is the simplest explanation for Radin's results. The longer it has been since a participant has seen an emotional image, the more anxious she becomes and the less she is able to relax. The times when she is least able to relax will therefore be the times just before the emotional images. Radin's experimental design could be modified to control for this. As an extreme measure, he could only show each participant a single image. If that isn't practical, a more convincing experiment would alternate randomly selected images with very emotional ones designed to reset the anticipatory strategy. Only the data associated with the randomly selected images would be used.